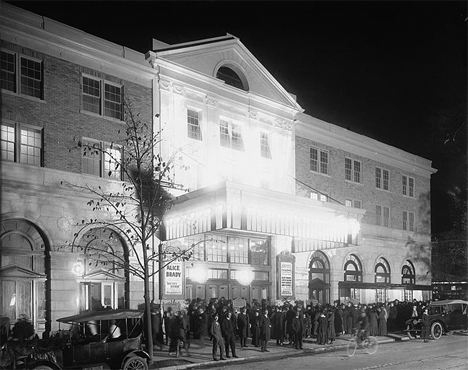 A popular movie theater in Washington D.C., the Knickerbocker Theater was packed with between 300 and 1,000 theater goers enjoying the silent comedy Get-Rich-Quick Wallingford when the roof collapsed beneath a load of snow on January 28th, 1922. A massive blizzard two days before had resulted in a significant accumulation of snow and ice, which put a tremendous strain on the structure’s flat roof. 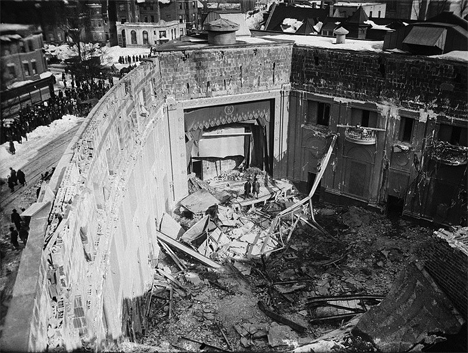 There was reportedly no warning of the collapse, like creaking or other unusual noises; it just suddenly gave way. 98 people died and 133 were injured. The collapse was blamed on a faulty design using arch girders instead of stone pillars to support the roof. The “worst engineering disaster of the 20th century” occurred just before midnight on March 12th, 1928 when a dam 40 miles northwest of Los Angeles burst, unleashing total chaos across Ventura County and claiming the lives of nearly 600 people. The problems began with the decision to have William Mulholland, a self-taught civil engineer known for building things fast and cheap, head the project of constructing the new St. Francis Dam, which would provide water to rapidly growing Los Angeles. 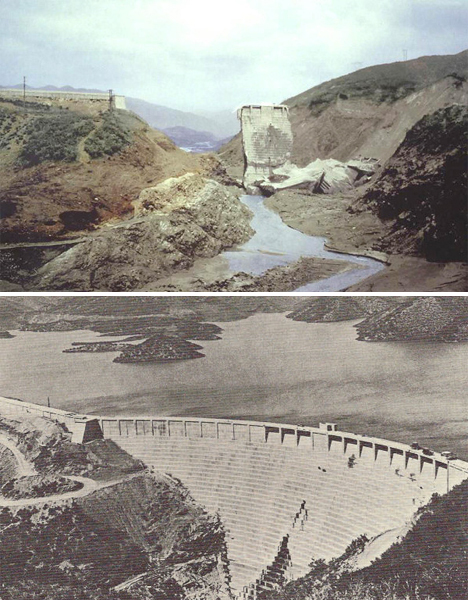 Cracks started appearing at the base of the dam soon after it was constructed, and on the morning of the disaster, a leak was discovered. Mulholland and his assistant decided it wasn’t a danger, declared the dam safe, and went back to LA. The dam keeper who discovered the leak, along with his family, was among the first fatalities when the dam broke that night, unleashing a wave that started out 125 feet in height and spread to two miles wide as it traveled across the valley. It flooded a dozen towns and traveled almost 54 miles before reaching the Pacific Ocean at 5:30 am. Many victims were buried at sea, their corpses washing up on local beaches for years afterwards, and bodies were continually discovered all over the disaster area for decades. One was found as recently as 1992. After the disaster, Mulholland resigned from his post and lived in isolation until his death 7 years later, taking full blame for the incident and never getting over his role in the deaths of so many. 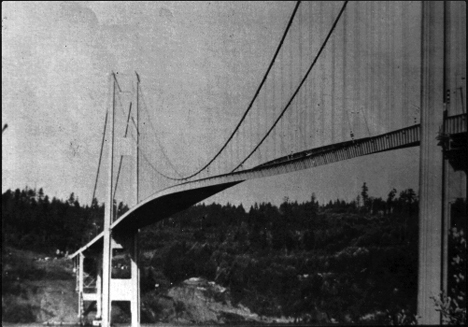 The original Tacoma Narrows Bridge was in operation for just over five months when it dramatically collapsed into the Puget Sound of Washington on November 7th, 1940. The third longest suspension bridge in the world at the time, it got the nickname ‘Galloping Gertie’ while still under construction due to the way it kicked and buckled in windy conditions. Thankfully, no one was killed when 40mph winds brought it down; the last person to cross the bridge managed to escape his car and crawl to the other side as the bridge was cracking, but his cocker spaniel Tubby was still inside during the collapse. The bridge wasn’t flimsy, and at the time, engineers believed the mass of it was enough to keep it structurally sound despite wind-induced vibrations that caused half the central span to rise while the other lowered. Drivers reported seeing cars coming from the other direction rise and fall on a wave as they approached. But the high winds on the day of the collapse caused a never-before-seen twist, pumping more energy into the structure than the flexing could dissipate. The suspender cables couldn’t control the motion. The collapse has become a lasting lesson for science and engineering, boosting study in the field of bridge aerodynamics-aeroelastics to influence the designs of all long-span bridges built since.